that graph of the heart. just to maintain the high. I don't find solitude agonizing, on the contrary. Holes in paper open and take me fathoms from anywhere. Once again the Harry Ransom Center at the University of Texas at Austin has mounted a marvelous online exhibition, Fathoms from Anywhere, a homage to Samuel Beckett (1906-1989). As noted in the Introduction, the exhibition derives "substantially from the catalogue published in conjunction with a Beckett exhibition [No Symbols Where None Intended] mounted at the Ransom Center in 1984 as part of a major conference" about the writer, at the time of which Beckett was still alive. In 2007, the center acquired from Beckett's former editor Richard Seaver a cache of Beckett-related papers that included hand-corrected manuscripts, typescripts, galley proofs, and correspondence from the years 1953 to 1973. That acquisition was added to the books and manuscripts the center first began obtaining in 1958, when it purchased the library of T.E. Hanley. The center has continually added to its significant holdings. The current Web exhibition draws from the entire collection. ▶ Beckett's career, from beginnings and early writings to final and posthumous works. On each page, you'll find links to manuscripts and publications, and, where available, information about productions and reviews, as well as audio of readings of Beckett's work. 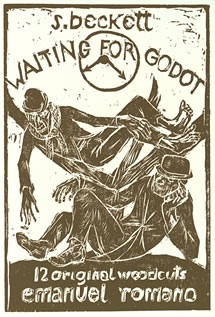 Individual pages are provided for such works as Waiting for Godot, Krapp's Last Tape, and Happy Days. Coverage of radio plays, short prose works, and poems in English also is provided. In addition, a separate page addresses the award of the 1969 Nobel Prize in Literature to Beckett. ▶ Circle of writers, critics, publishers, actors, editors, philosophers, playwrights, and others well-known and associated with Beckett, among them Sylvia Beach, Nancy Cunard*, Peggy Guggenheim, James Joyce, and Kenneth Tynan. The brief summaries are not hyperlinked, unfortunately; however, they do provide insight into some of the more influential members of Beckett's circle. ▶ Biographical timeline, beginning with Beckett's birth in 1906 in Foxrock, County Dublin, Ireland, and ending in 1995 with the publication of Beckett's Eleutheria. An interactive page allows visitors to share their thoughts and read others' impressions about the exhibition, their favorite Beckett work(s), why we should read Beckett, and questions about the writer. From the Samuel Beckett Endpage, which is hosted by the University of Antwerp and is the official page of the Samuel Beckett Society, you can access a range of Beckett-related resources, including Beckett journals, interviews, performances, and images. * See the center's Inventory of Nancy Cunard papers. If you've come in from the cold but still have energy to expend, head over to New York Bound Books to browse selections relating to New York, test your mission-oriented game skills with Pheon, a multi-media alternate-reality game, try your hand at text-analysis at WordSeer, listen to PennSound Radio, or watch a visualization of the Prelude from Bach's Cello Suite No. 1. Then go download a poetry app. ✦ New York Bound Books — "All Things New York for Readers and Writers" — is reincarnated as a Website. Don't pass up the opportunity to browse its wonderful resources! ✦ The Smithsonian's The Bigger Picture blog is one of my favorites, often offering links that send me exploring. A link in one recent post took me to WordSeer, an evolving text-analysis tool that produces visualizations of texts' grammatical structures. A current project is looking for language-use patterns in American slave narratives; an earlier one used WordSeer to compare use of the word "love" in Shakespeare's comedies and tragedies. Also see "Search Shakespeare's Works". See other earlier WordSeer projects here. Visualizations using The New York Times to look at tagging, articles mentioning "riots", and so on are shown here. ✦ PennSound Radio, a 24-hour stream of readings and conversations from PennSound's poetry archive, launched in mid-December 2011. The daily lineup includes rebroadcasts of a number of series, among them Live at the Writers House and Close Listening by Charles Bernstein, plus favorite performances. To access, use iTunes or the TuneIn app for iPhone, Blackberry, or Android. ✦ If you enjoy playing alternate reality games online, try Pheon at the Smithsonian American Art Museum. It's a variation on "Capture the Flag". As explained here, players align with one of two groups, then compete to complete various missions in which SAAM's art collections, exhibitions, and programs feature. The objective is to obtain the pheon, a talisman that will restore balance to the virtual world of Terra Tectus. ✦ Brooklynite Alexander Chen, who spends his days at Google Creative Lab, has created a visualization of the first Prelude from Bach's Cello Suites No. 1. An interactive version will test your musical skills at an elementary level. My thanks to PBS News Hour Art Beat for the link to Flowing Data, where this video was posted. Also see Chen's Conductor at this Writing Without Paper post. ✦ Iranian-born filmmaker and photographer Shirin Neshat created a video, "Winter", for The New York Times; a still from the video with an excerpt from Forugh Farrokhzad's poem, translated from the Persian by Farzaaneh Milani, was posted to the newspaper's opinion pages in December. Ai Weiwei was runner-up for Time Magazine's Person of the Year 2011. See "Ai Weiwei: The Dissident", Time, December 14, 2011. ✦ Late this past December the D.C. Commission on the Arts and Humanities announced the selection of five curators to complete 25 "ground-breaking" public art installations for the 5x5 Public Art Project to be presented during the Centennial Celebration of the National Cherry Blossom Festival March 20 - April 27. The curators are Amy Lipton, New York City, co-director, EcoArtSpace; Justine Topfer, San Francisco, international curator and writer, Out of the Box Projects; Richard Hollinshead, Newcastle-Upon-Tyne, United Kingdom, director, Grit & Pearl, and an artist, designer, and curator; Laura Roulet, Washington, D.C., sole local curator for 5x5, an independent curator and writer specializing in contemporary and Latin American art; and Steve Rowell, Culver City, California, artist, curator, and researcher. The projects are temporary (not to exceed four months). Additional information about the curators and the five artists each has selected is here and at the 5x5 Website. ✭ A solo exhibition, "Steven Katzman: Human Abstract" is on view through February 18 at Masters & Pelavin, New York City. Drawing on two decades of the artist's edgy, often disturbing photography, the show addresses the themes of love, death, religion, afterlife, and faith. ✭ Last week saw the opening of "Annie Leibovitz: Pilgrimage" at the Smithsonian American Art Museum, Washington, D.C. On view through May 20, the more than 70 photographs in the show, taken between April and May of 2011, will tour nationally. Eventually, the images on display will be added to the museum's permanent collection. 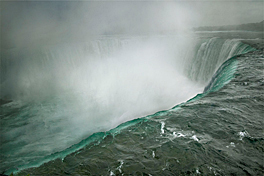 Among Leibovitz's photographic subjects are Niagara Falls, Walden Pond, Yosemite Valley, Robert Smithson's Spiral Jetty, sculptor Daniel Chester French's plaster casts of his own hands, and the homes of Emily Dickinson, Georgia O'Keeffe, and Elvis Presley. The book Pilgrimage is available through the SAAM store. The photographer, a contributing editor at Vanity Fair, spoke before a sold-out audience on January 24. ✭ The Morgan Library & Museum, New York City, showcases "Dan Flavin: Drawing", beginning February 17. Comprising more than 100 sheets from every phase of Flavin's career, this first retrospective of the artist's drawings also includes nearly 50 works on paper from Flavin's personal art collection, from landscapes by Hudson River School artists, to Japanese drawings by such artists as Hokusai, to works by 20th Century minimalists Donald Judd and Sol LeWitt, among others. The exhibition will run through July 1. Among exhibition-related events is a symposium, "Minimalist Drawing: The 1960s and 1970s", scheduled for April 27 (tickets are required). 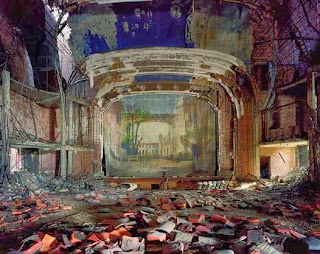 ✭ A not-to-be-missed survey of photography by three dozen international artists, "An Orchestrated Vision: The Theatre of Contemporary Photography" opens at the St. Louis Art Museum on February 19 and runs through May 13. As the show's title suggests, the works are to be viewed as "meticulously construct[ed] environments" that "operate in the boundaries between fact and fiction." Among the three dozen artists represented by the more than 40 images in the exhibition are Tina Barney, Edward Burtynsky, Nan Goldin, Thomas Struth, Carrie Mae Weems, collaborators Alexander Birchler and Teresa Hubbard, Andrew Moore, and Gregory Crewdson. A related installation, "The First Act: Staged Photography Before 1980" is on view through April 29. Related exhibition programs are described here. Chromogenic Print, 40" x 50"
✭ At the Wellcome Collection you'll find "Miracles & Charms", comprising two exhibitions on view through February 26: "Infinitas Gracias: Mexican Miracle Paintings" and "Felicity Powell - Charmed Life: The Solace of Objects". The first features more than 100 votive paintings from the collections of museums in and around Mexico City and two sanctuaries in the Bajio region. It includes images, news reports, photographs, devotional artifacts, and films and interviews. The virtual Votives Gallery includes a selection of stories and that paintings that bring them to life. Exhibition-related films are available online. The second displays 400 amulets, some simple coins and others elaborately carved shells, as well as 10 artworks by Felicity Powell. 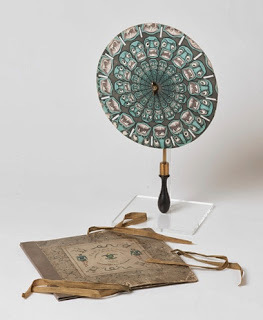 Browse the online Amulet Gallery and learn more about the objects and their owners. ✭ The V&A Museum of Childhood is not just for the young. If you're in London, be a kid again and go see "Magic Worlds", continuing through March 4. The show, featuring costumes, tricks/illusions, film merchandise, optical toys, paintings and ceramics, dolls and puppets, illustrated books, and interactive activities, promises to delight anyone who enjoys fair tales and fantasy literature and wants to know more about the origins of magic. The only thing that has changed is the sky. Before the January 12, 2010, earthquake that devastated Haiti, hundreds of thousands of the "Sanguine" — or "soulless", as the orphans and abandoned children of Haiti are called — lived by their wits on the streets. Since the earthquake, these children's dire existence has become even more tenuous. In Strange Things: Children of Haiti, produced and directed by Alexandria Hammond, three of the Sanguine, youths in Cap-Haitien in the North, tell their stories. The documentary took Hammond three years to make. What is remarkable about the film is how beautifully it contrasts the hope we can hear in the boys' voices with the wreckage of the country. Amid both beauty and ugliness, the Sanguine hold fast to their dreams, which they articulate honestly, often movingly, and with great clarity. STRANGE THINGS (Children of Haiti) TRAILER from Strange Things Movie on Vimeo. Other clips are available here. Watch Children of Haiti on PBS. See more from Independent Lens. the viewer that moment of insight. The Seattle Art Museum's exhibition "Luminous: The Art of Asia" ended January 8 but those lucky enough to see the exhibition in person also found themselves in the presence of a contemporary artist of uncommon talent: Do Ho Suh (b. 1962), who not only provided commentary about the masterpieces on view (see "Artist Do Ho Suh Talks About His Role in SAM Exhibit") but also created a multimedia installation, Gate, especially for the show. Comprising a fabric curtain that serves as a screen for projected images, a magical passageway, and a threshold through which one enters to reach a new space, Gate, Suh explains, allows us to explore notions of emptiness. "Our notion of emptiness is quite different in the East", the artist says. "The void is not empty or bleak but charged with meaning." You'll find additional short clips of Gate, showing it from different perspectives, here (2:26 minutes) and here (1:33 minutes). 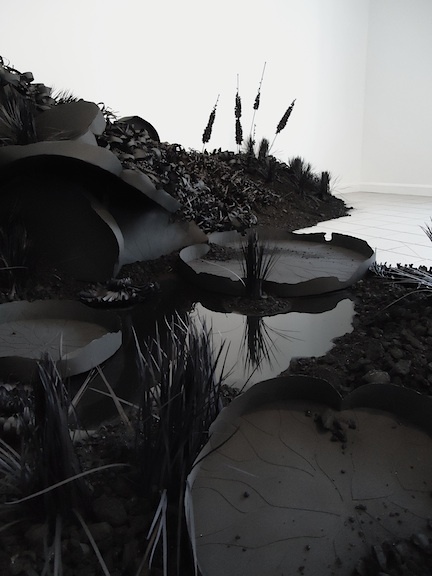 The Korean-born Suh, who came to the United States in 1993 and now lives in New York and London, also created for SAM Some/One (2001), a poetic large-scale sculpture created from life-size stainless-steel military dog-tags, nickel-plated copper sheets, glass fiber reinforced resin, rubber sheets, and a steel structure. It's a provocative installation, raising questions about identity, both individual (each tag representing one soldier) and collective (the military as literally disembodied). The hardness of the steel in the completed sculpture evokes images of impenetrable armor, yet the armor is but scores of thin metal dog-tags, each calling up the memory of a life lost. Listen to Suh talk about Some/One here. His sculpture was first exhibited at (and subsequently acquired by) SAM in 2002. Suh's Staircase, for the exhibition "Dreamscapes" at the Pulitzer Foundation for the Arts, is shown being installed in this video and in place in this video. In this video, you can see the piece as it looked at Tate Modern. Another of Suh's installations exploring perceptions of personal space is floor (1997-2000), seen in a very brief clip here. Images of floor installed at the Indianapolis Museum of Art may be seen here. Additional work that merits attention includes Cause and Effect, commissioned for Western Washington University's Academic Instructional Center; Home Within Home, which was exhibited at Lehmann Maupin Gallery in New York City; and Paratrooper at Tufts University Art Gallery (2008). at sorting sugar from salt? The title and first line are an inversion of two lines from Stephen Crane's poem "In the Desert". This past December Simon Armitage (b. 1963) launched "Close-up Poetry", a series at The Guardian in which poets read their own favorite poem before the camera. Armitage was first up with a straight-on reading of "An Accommodation", a prose poem from his 2010 collection Seeing Stars (Knopf, 2011), one of more than a dozen poetry books he has penned. Currently professor of poetry at University of Sheffield, United Kingdom, Armitage was awarded the Keats-Shelley Prize for Poetry in 2010 and a 1992 Forward Prize (for Kid). He has taught at the famous Iowa Writers' Workshop at University of Iowa and is a freelance writer, translator (Sir Gawain and the Green Knight and The Death of King Arthur), broadcaster, and playwright. Costa book-of-the-year winner Jo Shapcott (b. 1953) reads "I Go Inside the Tree" from her most recent and award-winning collection Of Mutability (2010; available through resellers; Faber and Faber, 2011, Kindle). President of The Poetry Society and professor of creative writing at Royal Holloway College, University of London, Shapcott has published more than a half-dozen other collections of poetry, including Tender Taxes (2002; Faber and Faber, 2010; Kindle), comprising versions of Rainer Maria Rilke's poems in French. Shapcott also is an essayist, anthologist, and translator. Among her other awards are several Forward Poetry Prizes and, most recently, the Queen's Gold Medal for Poetry. The series is a welcome introduction to poets on the other side of the Atlantic and is instructive for what it shows us about these talented writers' ability, or not, to deliver their words via video. Several of the poets give beautiful readings; one in particular would be wise, perhaps, to brush up on memorization. Other poets participating in Armitage's series are: Paul Farley, reading "Treacle" from The Boy from the Chemist is Here to See You (Macmillan UK, 1998); Liz Lochhead, reading "My Rival's House"; Imtiaz Dharker, reading "Honour Killing" from I Speak for the Devil (Bloodaxe, 2001); Robin Robertson reading "At Roane Head", which received a Forward Prize for best single poem in 2009; Fleur Adcock, reading "Strangers on a Train", from her collection Dragon Talk (Bloodaxe, 2010); Fiona Sampson, reading "Envoi", from her collection Rough Music (Carcanet, 2010); and Michael Symmons Roberts, reading "Pelt" from Corpus (Cape, 2004), winner of the Whitbread Poetry Award (now known as Costa Book Awards). carry something beautiful in your mind. Too cold today to be outside? You've come to the right place to warm up your brain. You'll find a new Website about early photography as well as links to that wildly popular Octavio Paz poetry app that everyone's buzzing about, a blog for DIY craft projects (including such inspirations as vintage-tapestry animals and a button piano), and the rather strange but charming world of Hobo Lobo. And don't miss Fiverr®.The video feature is Seventeen Evergreen's delightful piece on yarn-bombing. Enjoy! ✦ The collection of Carnegie Institute, Museum of Art records has been digitized. Go here for a post documenting the effort. ✦ Proof that poetry is popular? A poem by Nobel laureate Octavio Paz, "Blanco", has become a wildly successful app in Mexico. A Spanish-language video presentation of the app, which includes video interviews and texts by writers that influenced Paz, is on YouTube. ✦ If you're looking for a source for all levels of DIY craft projects, you need look no further than the Craft Blog. I especially like the recent post on life-size, taxidermy-style tapestry animals by French designer Frederique Morrel. (Be sure to take some time on Morrel's site; the creations there are stunning.) The button piano by sculptor Augusto Esquivel (stop in here, too!) also will leave you inspired. Additional views of the piano are here and in a video that features additional Esquivel installations. ✦ If you're a fan of pop-up books, you might enjoy the virtual pop-up world of the Hobo Lobo of Hamelin. (Be sure to move around or click your mouse to take advantage of sound and other effects.) For an explanation of the creation of Hobo Lobo, go here. ✦ Yarn-bombing has been the rage for a while. This video from Seventeen Evergreen is an example of yarn-bombing taken to another level. Enjoy! ✦ Drop in virtually to Still Point Art Gallery's online exhibition "Abstraction Attraction!" Six artists in the show have been named, deservedly, Artists of Distinction: Steven Bogart, Ling Ling Cheng, Nomi Drory, David Duane Kinsey, Keith Parks, and Cat van der Heiden. The feature remains online through February 14, 2013. 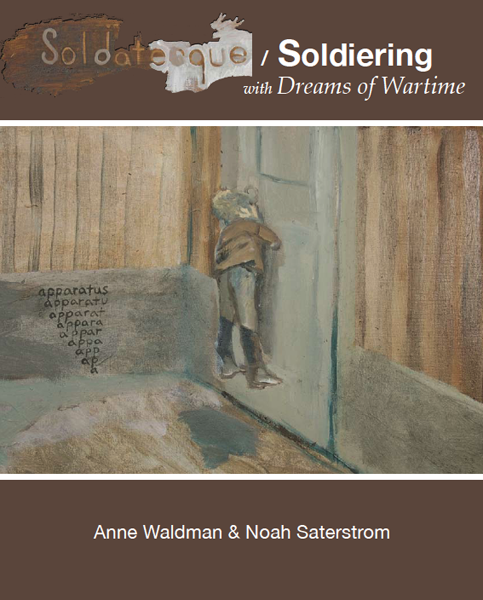 ✦ In a collaboration with poet Anne Waldman, artist Noah Saterstrom created a 45-foot-long frieze of oil paintings titled Soldatesque/Soldiering: with Dreams of Wartime. Exhibited last year at the University of Arizona's Poetry Center in Tucson, the panels may be viewed here at Saterstrom's site. A book about the project, including an introduction by Bill Berkson, is available through the BlazeVOX online store and at Amazon. Art Cart - Saving The Legacy from RCAC on Vimeo. Fellowships with Art Cart are available. ✦ Art selection by genome? According to this Wall Street Journal article, computers can "match specific searches with works that have the closest genome values. . . to offer a selection that anticipates a user's interests and tastes." A computer science engineer from Princeton University is behind Art.sy/, which is powered by The Art Genome Project, and chief curator emeritus at MoMA, John Elderfield, has logged on as an advisor. (Pssst. . . You have to ask for an invitation to see how well the project works for you. You'll want to be among the 1-percenters at a minimum.) Not interested in that game? Try Artsicle instead. ✦ The Guggenheim deserves praise for making available a downloadable collection of its titles, including essays and catalogues in e-book format, all searchable alphabetically or by date range, subject, or title. More on the museum's publications can be found here. ✭ At the Austin Museum of Art, Austin, Texas, "Two Takes on One Space: Lauren Fensterstock and Steve Wiman" continues through February 19. Maine's Fensterstock has created two quilled room-size "landscapes" of intricately cut and curled black paper that address both the beauty of and chaos in nature. Austin-based Wiman has repurposed old objects into assemblages that reflect the artist's eye for combinations of texture, form, size, and color, allowing viewers to see his arrangements as something "new". His installations are wonderful. My thanks to Ann Martin at All Things Paper for introducing me to Fensterstock's marvelous work. ✭ The photography of Arthur Drooker is on view in "Lost Worlds: Ruins of the Americas" at the Art Museum of the Americas (Organization of American States), Washington, D.C. Continuing through February 24, the show includes images Drooker took of 33 ruins in more than a dozen countries over three years, including UNESCO World Heritage Sites, a king's palace in Haiti, Inca fortresses in Peru, Maya pyramids in Mexico, and a pirate-sacked colonial city in Panama. Drooker used a specially adapted digital infrared camera to produce his otherworldly black-and-white photographs of ruins. A large-format book with 115 images and an introduction by Pico Iyer accompanies the exhibition. A "Lost Worlds" limited edition with a clothbound copy of the book and a choice of one of two signed prints is available, as are signed archival digital pigment prints in limited editions of 20. ✭ In Salem, Massachusetts, The Peabody Essex Museum just opened "Shapeshifting: Transformations in Native American Art", on view through April 29. 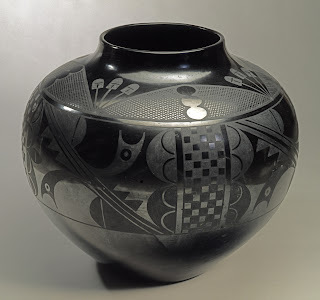 The exhibition of sculpture, paintings, ceramics, textiles, photographs, videos, and large-scale installations brings together both rare historic pieces and contemporary Native American artwork, showcasing both diversity and conceptual continuity. The show's nearly 80 works, which are drawn from public and private collections worldwide, are arranged thematically: "Changing: Expanding the Imagination", "Knowing: Expressing Worldview", "Locating: Exploring Identity and Place", and "Voicing: Engaging the Individual". A catalogue accompanies the exhibition. ✭ New York City's Asia Society is presenting through March 25 the work of Sarah Sze. The exhibition, "Infinite Line", features lithographs, silkscreens, and graphite, ink, and collage drawings, as well as all-new sculptural work that use the vertical format of a hanging scroll and extend from the wall to the floor. At the "Infinite Line" link you'll find an introduction to the exhibition, an interview with the artist, images of a selection of Sze's work, and a variety of resources. An exhibition catalogue by Melissa Chiu accompanies the show. knowing than to have answers that might be wrong. Nobelist Richard P. Feynman (1918-1988) was a brilliant physicist, one of a number of esteemed scientists who participated in the Manhattan Project, the work for which resulted in creation of the atomic bomb. The wearer of many hats, he also was a translator of Mayan hieroglyphics, a musician, a teacher, and a story-teller. He remains a source of endless fascination, as a perusal of the News section of the Feynman Website quickly reveals. 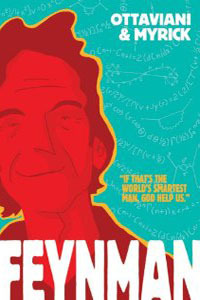 By chance, I learned that the creator of the much-lauded The Sagan Series, Reid Gower, also turned his attention to Feynman to create a companion project The Feynman Series, the objective of which is to promote scientific education and scientific literacy in the general population. Here's the first of three videos, Beauty (5:11 minutes). The other two are Honours (3:57 minutes) and Curiosity (4:24 minutes) All three are worth the brief amount of time required to view them. Symphony of Science — The Poetry of Reality (An Athem for Science): Feynman makes an appearance in this music video, the fifth in a series promoting science through words of wisdom. Richard Dawkins, The Oxford Book of Modern Science Writing (Oxford University Press, 2009): A chapter on Feynman is included in Part III, What Scientists Think. The Nobel Prize in Physics 1965 (Feynman, Sin-Itiro Tomonaga, and Julian Schwinger were awarded the Nobel jointly "for their fundamental work in quantum electrodynamics, with deep-ploughing consequences for the physics of elementary particles". belongs in the world of art versus science. . .
into the complexity of science. . . . Award-winning Boston-based artist Nathalie Miebach has a deep interest in science, and specifically weather data, which she translates into astoundingly beautiful and highly complex woven sculptures and musical scores that are mapped to weather conditions occurring at a specific time in a specific place. Below is Miebach's very brief introduction to and explanation of her extraordinary work. Be sure to view the images of her "Changing Waters", a series of sculptures, wall installations, and musical scores that examine meteorological and ocean interactions in the Gulf of Maine; "Tides and Poles"; and "Changing Weather". Go here to view images of and listen to a few of her musical scores. Miebach, a 2011 Ted Global Fellow, exhibited in 2011 at the Fuller Craft Museum, Brockton, Massachusetts. Data Flow 2: Visualizing Information (Die Gestalten Verlag, 2010) Miebach's work is included in this book. of too-sun-tanned leaves giving up their grip. let brain-stormed days break from fevered nights. Once a quarter I share with readers the books on my tables and night stand. Below, in alphabetical order by book title, are some of the books, not all new, that I've read over the last few weeks and months or am reading now. There is not one I wouldn't recommend. I have not listed all the poetry collections and chapbooks I'm dipping in and out of; some of those will be reviewed in my Monday Muse column in the coming month or two. 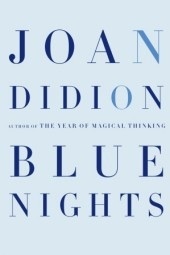 ✭ Blue Nights by Joan Didion (Knopf, November 2011) ~ I read this book — some call it memoir; Didion calls it nonfiction — almost straight-through and see it as the necessary companion to the author's The Year of Magical Thinking. Classic Didion, it shows us the raw, unexposed underside of grieving, the parts of loss we hold deep inside and on no day do not think about. ✭ Living to Tell the Tale by Gabriel Garcia Marquez, translation by Edith Grossman (Vintage/Random House, 2004) ~ This autobiography ranges from birth year, in 1927, to the 1950s. Like anything by Marquez, this book will leave you awed by the writer's extraordinary story-telling ability. It's one of the most evocative romps through autobiography I've read. ✭ My Happiness Bears No Relation to Happiness: A Poet's Life in the Palestinian Century by Adina Hoffman (Yale University Press, 2009) ~ I discovered this compelling, award-winning biography while doing research for a post last fall about the work of the late Palestinian poet Taha Muhammad Ali. The book is both superbly researched and written, and I came away with great admiration for the poet whose contemporaries included the late Mahmoud Darwish. Hoffman, an essayist, critic, and co-founder of Ibis Editions, tells the story of a remarkable man, recreating his life's story within historical and cultural contexts rendered with objectivity and empathy. There is a lot of political history also in this book that I often found heart-breaking to read. 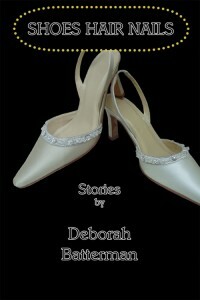 ✭ Shoes Hair Nails: Stories by Deborah Batterman (Uccelli Press, 2005) ~ I received this collection of wonderfully told stories, set in Brooklyn, New York City, and Las Vegas, as a gift. Much of what makes these stories work so well is Batterman's skillful use of detail, her ability to create an authentic voice for each of her spirited characters, her humor, and her insightful reading of relationships. A story a night from the book is an ongoing pleasure. ✭ Something Urgent I Have to Say to You: The Life and Works of William Carlos Williams by Herbert Leibowitz (Farrar, Straus and Giroux, November 2011) ~ Though I'm only a hundred-plus pages into this highly erudite, massively detailed, 452-page biography of the poet, I can say that it is clear that Leibowitz has hold of a subject of enormous interest to him. I find particularly interesting Leibowitz's perspectives on and literary analyses of Williams's poems. ✭ So What: New & Selected Poems, 1971-2005 by Taha Muhammad Ali, translations by Peter Cole, Yahya Hijazi, and Gabriel Levin (Copper Canyon Press, 2006) ~ I found many of the poems in this collection to be moving. The poet's landscape, both internal and external, is deeply scarred yet there is place for humor in these poems and always the work evokes a sense of humanity, justice, and love come by naturally. Note: The Arabic version of each poem appears en face. ✭ Townie by Andre Dubus III (W.W. Norton, 2011) ~ I've been reading this memoir slowly, as I find I can take only so much of the brutality and grittiness Dubus delivers so cinematically. Dubus's portraits of the people in his life, from his divorced parents to street thugs, are drawn with great clarity and skill and are very much alive on the page. The old mill towns in which Dubus grew up are the kind many of us have at least passed through at some point in our lives and hope never to see again. The life Dubus lived is not one to envy. That he was able to make so much of himself despite his harsh environment is a testament to his strength to survive. ✭ Woolgathering by Patti Smith ~ Completed by Smith on her 45th birthday, Woolgathering was first published in 1992 by Hanuman Books. The new edition, republished late last November by New Directions, includes a selection of Smith's photographs and illustrations and a new piece, "Two Worlds". 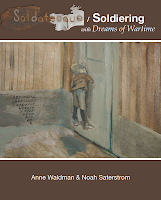 Both memoir and fiction, Woolgathering interweaves childhood remembrances with self-discoveries, truths with the imagined. If you've read Smith's wonderful Just Kids, you know how beautifully she writes. Woolgathering is a small book that, to use Smith's words, "[carries] one away, into a realm that could not be measured nor even remembered." It belongs on your shelf next to your Annie Dillard. worms or shoals of parrot fish. and accept the host of water. This poem is my response to today's photo prompt at Magpie Tales, which features the image of one of more than 400 life-size figures comprising artist Jason deCaires Taylor's underwater sculpture installation La Evolucion Silenciosa (The Silent Evolution), an environmental public art project in Mexican waters intended to promote the recovery of coral life in the ocean. 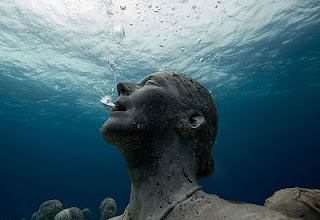 Read more about deCaires Taylor's underwater museum here. Additional images of the extraordinary project are here. Write your own poem or flash fiction response to the prompt, using the image provided, then go here to add your own link and to read and comment on the other participants' contributions.
. . . The rain I am in is not like the rain of the cities. recognize, rhythms that are not those of the engineer. . . .
Also see Thought for the Day, December 5, 2010.